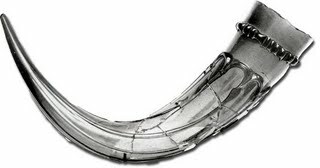 Horn-shaped glasses show up in Sweden and Denmark from the 3rd C and were made by the Franks a little later (particularly the Lombards). They were rare after the 7th C, though they occasionally show up in Carolingian manuscripts. Sometimes, these were actually for holding ink (find from 9-10 C France). Glass cups or beakers of the 9th or 10th C might well be vivid blue, bluish-green, or red, decorated with fine canes (either one colour or more often colourless and opaque white or yellow glass twisted together). The canes could be placed horizontally or vertically on the body, but some cups have them on the rim. This is a design feature found almost exclusively at coastal sites in Britain, Northern Europe and Scandinavia. types of poor quality utilitarian ware, using a new composition of glass made with local potash produced from bracken and other plants (instead of importing from Egypt). Nevertheless, eastern glass continued to reach Britain and Sweden until as late as possibly the 11th C. Examples include a Persian glazed cup found in Sweden that looks like a small, rounded coffee cup with a handle large enough for one finger, and at least one nice example of an Arabic glass from Sweden that looks perfect for an old-fashioned or a whiskey sour. All glass drinking vessels were rare, and were probably costly imported luxury goods. On : "Viking garb accessories..belt and pouch?" IRON Mandrils - Iron Oxide bead release?